Free! 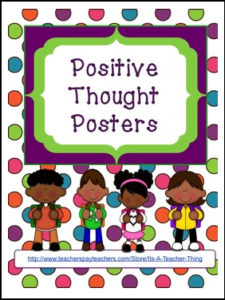 The Positive Thought Posters were created with the idea of spreading just that: POSITIVE THOUGHTS. I wanted something in my classroom that kids could read when their eyes are wandering. I also have them on the door, so when students leave the posters are the last thing they see. Recently, I’ve put them up all over our campus for the entire middle school population to enjoy. I hope you find them inspiring. • Please go to your My Purchases page (you may need to login). Beside each purchase you’ll see a Provide Feedback button. Simply click it and you will be taken to a page where you can give a quick rating and leave a short comment for the product. I value your feedback greatly as it helps me determine which products are most valuable for your classroom so I can create more for you.